Superior Spider-Man #9 was promoted by Marvel and the issue’s creative team as being filled with controversy. 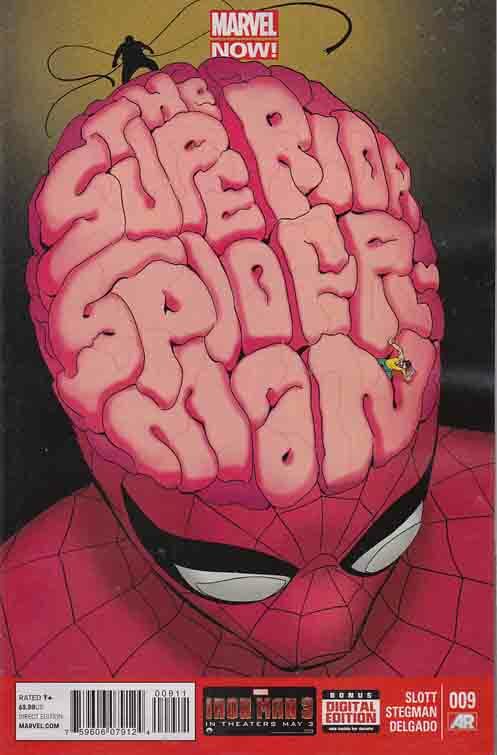 It also happens to be my favorite issue of this young series, and perhaps Dan Slott’s finest hour writing Spider-Man comics. I’ve honestly given up trying to figure out why there is a segment of the Spider-Man fan base so unhappy with the new status quo brought on by the Superior era. I’ve run out of things to say to people who dwell on the fact that the man wearing the Spider-Man mask isn’t Peter Parker – or at least “normal” Peter Parker. I argue that the story of Superior is unquestionably a story about a Peter: Not only is it a tale of the character facing perhaps his greatest adversity yet, but the Superior concept also serves as an entire referendum on what it actually means to be Spider-Man. At this rate, you’re either along for the ride, or you’re taking the ostrich approach to this series and Slott’s writing. And you’re obviously entitled to either. But for those who have been open-minded about this risky new concept being undertaken, who think there’s more to Superior’s status quo than just shock value and desperation marketing, I think you probably share in my opinion of adoration for Superior Spider-Man #9. 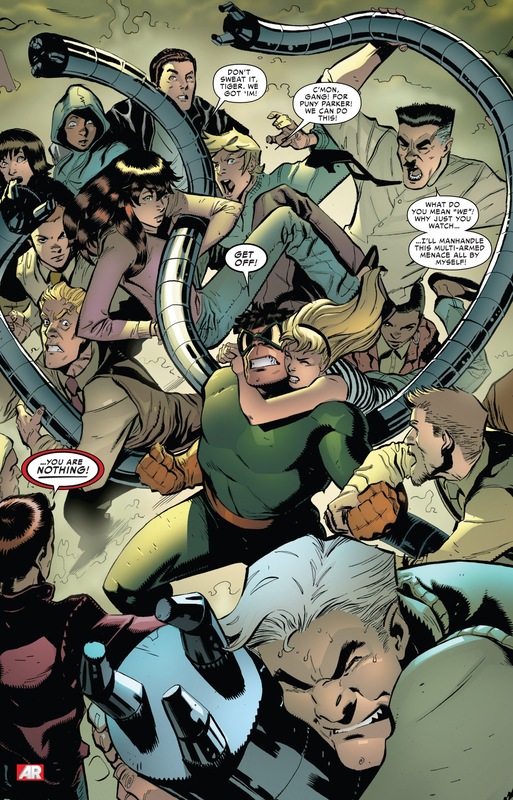 The battle between Peter and Doc Ock within Peter’s mindscape goes down as one of the most epic confrontations in the character’s history. In this fight for control – this fight to determine who is the “true” Spider-Man – every page is filled with high stakes and desperation. Ryan Stegman illustrates the finest looking issue of Superior to date, and one of the most visually stunning Spidey comics in recent memory. 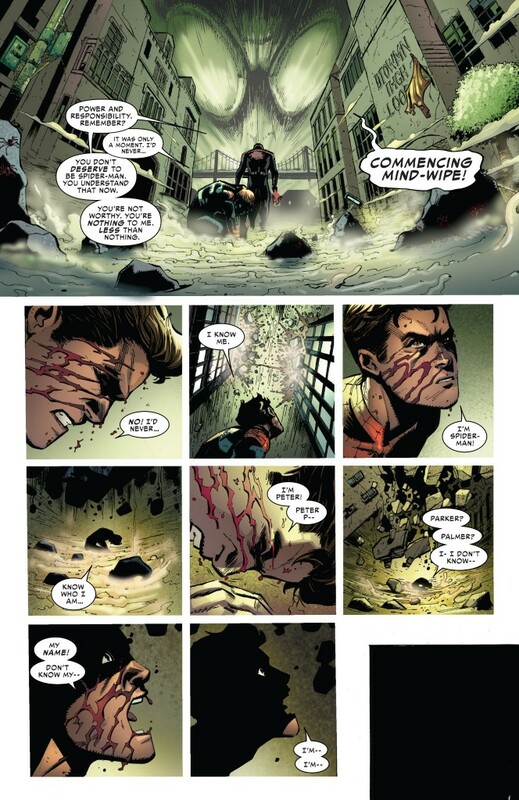 Over the past few years, we’ve had other instances of visiting Peter’s memories/mindscape, whether it be the chilling sequence from 2011’s “No One Dies” after the death of Marla Jameson, to the heartbreaking “one last fight” scene in Amazing Spider-Man #700. But Stegman’s dreamscape in Superior #9 is more nightmare than nostalgia. The specter of Otto Octavius looms everywhere, while the pages are filled with darkness and despair. Slott and Stegman craft an issue where it’s abundantly clear that this showdown is Peter’s very last shot (for now, of course). I loved the game of one-upmanship between Peter and Otto. How the story progressed from Peter’s friends and family, to his rogue’s gallery, to Spider-Man vs. to Doc Ock, to Amazing Spider-Man vs. Superior Spider-Man. In many ways, this was the career retrospection that ASM #700 probably should have been, and the more time I have to think about the issue, the more I believe Superior #9 was the special centennial issue Slott wanted all along. One of the major points of contention I’ve read/heard from fans is that the story’s stunning conclusion was not “in character” for Peter. Balderdash. When has Peter ever been in a situation like this before – his greatest nemesis stealing his body and masquerading around New York as Spider-Man? Yes, “with great power, comes great responsibility,” but I absolutely accept that Peter would have a moment of weakness born from self-preservation in Superior #8 and try to prevent Spider Ock from performing surgery on the dying child. Yes, there would have been blood on Peter’s hands if that was the case, but how much blood would he spare if he was able to successfully wrestle control of his body back from the tenacious clutches of a known sociopath? Peter Parker’s life as the hero Spider-Man has long been defined by one mistake, one lapse in judgment. And yet, I’ve never been under the impression that the character still isn’t trying to learn from this mistake, all while making new ones that he must also learn from. That’s a big reason why I don’t accept the “out of character” argument for Superior #9’s ending. This character, like a real person, is still evolving and adapting. He hasn’t achieved flawlessness. If he did, I would become bored with the character, and so would probably most of you. Something that Dan Slott has done very subtlety since the start of the “Big Time” arc is to portray a Peter Parker/Spider-Man who may be losing a bit of his self. Peter’s personal successes – the job at Horizon, the relationship with Carlie – have built the character up, but at a cost. The character has constantly sought validation from the public and his peers, and felt slighted when he hasn’t, even during some of his finest hours. Doc Ock’s slam of Peter just wanting to be the “friendly neighborhood Spider-Man” is a direct criticism of the character’s digression. Peter’s “no one dies” mantra was one filled with delusion. It’s a black and white declaration that doesn’t accept the shades that color the Marvel universe. Peter started making more and more mistakes because of this mantra, mistakes that left him vulnerable and empowered his enemies. This fall from grace has actually been well telegraphed. What I found the most stirring about the final confrontation between Peter and Otto was how Doc Ock was able to finally subdue Parker. It wasn’t via feats of strength, but by demoralizing him and capitalizing on the character’s long-standing guilt and insecurity. 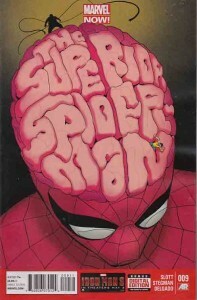 Otto exposed that Peter has lost track of who he really is – both in the Superior arc, and in the issues of ASM that preceded this story. So when Peter forgets his Uncle Ben – when he forgets his own name and mutters Peter Palmer in a nod to one of the biggest editing blunders in comics history (when Stan Lee actually called his own character by the wrong name in ASM #1), the moment feels earned. Depressing, but earned. We’ve seen this character buried under rubble in the final chapter of the “If this be my destiny” arc. Now, the character is buried under his own guilt and lack of identity. This is truly rock bottom for Peter. And that’s to say that I, without question, still believe Peter will be back. For those who think the character is dead for good this time, I have a bridge to sell you. 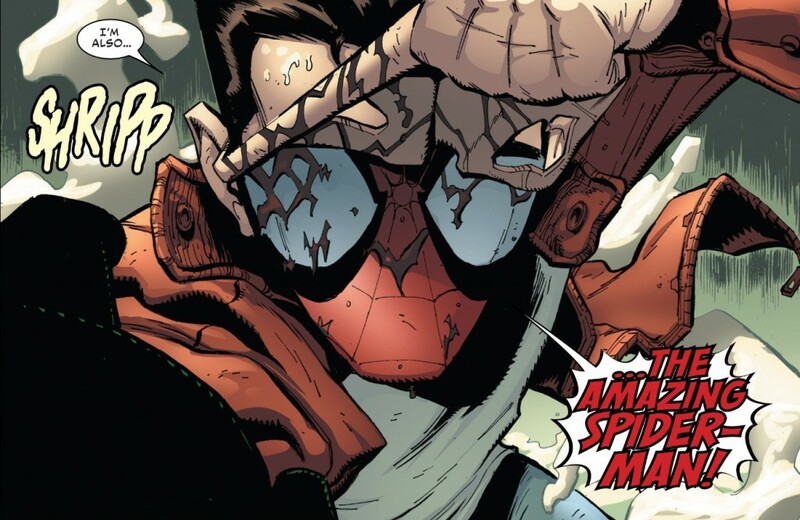 I have no idea exactly HOW Peter will return – and that’s what’s going to make these next however many issues of Superior all the more exciting to read – but all I can say is that actions have consequences. Otto Octavius, a man of unquestioned brilliance, has effectively erased certain sections of his brain chemistry. I find it impossible to believe that these actions will not have consequences. Meanwhile, what we’re left with going forward is a comic book that can go in a number of different directions – starring a totally unknown version of the character. Who is the Superior Spider-Man? Will this be Doc Ock redeeming himself as a hero? Will this mark the return of the dastardly Master Planner? Will the character be something else entirely different? I have no idea. But I have full confidence that Slott does. This is a writer who continues to build on everything he’s done prior to this. I can’t disrespect someone who is this precise and intricate with his writing. All I can do is trust them and let them tell their story. Some of my favorite moments as a reader have come out of total surrender. I wish I could share your enthusiasm for the direction Slott is taking Spider-man but to me Ock is a mass murderer who has destroyed a good man’s life and I can’t cheer that on. If Peter’s gone from the book there is no point in reading it. I enjoyed Spider-Man because he has a code. The world is a dark place and adults and children need heroes to look up to. I wouldn’t want my nephew reading this and thinking it was okay to take from someone else what he wanted. To me a character with no code is boring. He is just going to do what he wants to or what is easiest. Doc Ock is no hero as long as he has taken from someone else what doesn’t belong to him. In essences he has murdered Peter twice. There are times when I like characters like the Punisher and Wolverine, but only small doses. I would not want to hang out with them as they are also killers. It has sadden me to hear people say how much they enjoy the new gritter and grim Spider-Man. I think a lot of people just like the costume and skill set not the character under the mask and the trials and tribulations he endured. I for one hope Peter Parker comes back sooner then later. I would rather save my money then buy these books and now I see Marvel is bring on more “villian” books. I have always bought the comic and the trade paperbacks but I won’t be for Superior. Cardiac would have performed the surgery and saved the girl. I use to look forward to getting Spider-man. Now it just upsets me and I think why bother. I can read the newspaper and read about the other “Doc Ock’s” of the world and how they think they are doing good but actually are messing things up, as they take from good people. Warren, I’m sorry you feel that way. And while I understand where you’re coming from, I just don’t interpret the direction this series is going the way you do. I don’t see Slott’s end game in being creating a Spider-Man who is more in line with Wolverine and Punisher. For me, this status quo shift is a referendum of what it truly means to “be” Spider-Man, that it’s more than just a costume and web shooters. I also maintain because of that, Peter will inevitably be victorious, one way or another. I really wish I could be as optimistic as you guys who follow the Superior Spider-Man. I tried reading it, I really did but whenever I do the series just irritates me and that isn’t good. I read ASM for the light jab humors and the over all “Friendly Neighborhood” feel it has always delivered and I just don’t feel that with SSM. So as much as I want to wait for the return of Peter by reading on. I will just skip and wait. Maybe in the future when Peter returns I will pick it up but that still just remains a maybe. haven’t you notice all the big villains coming back? Osborn? mother frackar JACKAL? hell there is a chance we wind up with 2 spider men. slott is cooking something big and if villains as notorious on peter life are here ( an such Parker obsessed genius ones) that means peter is on his way back. i sort of miss ultimate peter more though he keep more of a juvenile Parker charisma and greater sense of lost and responsibility. I’m so glad to finally read something positive about Superior Spider-Man. I feel like the only reason people hate it is because they actually believed Peter would never come back (at least now we have verbal confirmation he will, and soon). I have never once believed that Peter was gone for good. I mean, sure, Marvel did that in the Ultimate universe, but in the 616 universe? Never! This is the flagship Spider-Man. The Original. Marvel is NOT going to kill him off for good! I have to admit that I am a bit sadistic in that I love seeing the hero be absolutely torn to shreds. Of course, this is right before they stage a come back and triumph over evil. It makes the victory all the sweeter. If anything, I feel this whole series is setting up Otto for his greatest defeat. He will fall harder than he ever has before. I wouldn’t be surprised if Doc Ock doesn’t survive. Or, if anything, he’ll be left in a very bad way, and rightly so. He’s trying to live this new life, but we, the audience, were never once supposed to actually feel sorry for him, or happy for him. It has all been about making him worse than he was before while making Peter better. But Peter will survive. Oh yes, Peter will be back. I always kept faith that he would.